The Lovely & the Lace, this tribute to all that is Fashion-Forward and Daringly-Real, fills in the artist-void left by so many fashion-layouts. This palette of visual-mastery incorporates dynamic avant-garde style-trends into some of this season’s most decadent Couture, as shown in the December Issue of Vogue Russia. This is hardly a mockery, rather, the brave new additions of over-the-top elements of ruffles, lace, and sheer – infusing a level of, Danger to the Safe/Pernicious to the Perfect. 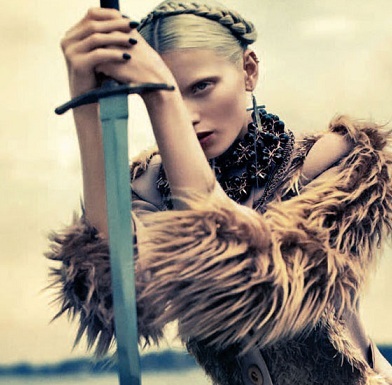 Richard Bush’s ode to the “fashion-temptress”, gives us a vision of Abbey Lee Kershaw as this brave “style-soldier.” Willing to break the barriers of expectations and fly. This is Beyond the Runway and Outside of the Page, it’s about mixing the Mad with the Sane in an effort to innovate. Images courtesy of FashionGoneRogue.com.